It is the last of the Soft-Shells, beginning of grilling season and my first time grilling crab. I had another idea for crabs over pasta but I felt I needed at least four crabs and we only had two left. So I will have to pick up four soft-shells later to try and make it. My main suggestion on these crabs is to make sure you do not let the crabs fall between the grills. Make sure they stay spread out. I had the legs of one crab fall between and it just charred the flavor out of them. the ones that stayed on top of the grills were very flavorful. These crabs are really buttery so you do not need to dip them in the usual butter lemon sauce used for seafood. Enjoy! Heat a medium skillet over medium high heat. Once heated add bacon to skillet, sprinkle essence over bacon and cook for 4 minutes or until bacon is about half way cooked. Wrap 1 bacon slice around each green onion and sit to the side until ready to grill crabs. In a small sauce pan heat butter and garlic over medium heat until butter is melted. Once butter melts turn heat to the lowest setting and add the remaining sauce ingredients. Keep warm until ready to use. Pat crabs dry with paper towels. Using a fillet knife cut crabs tops open across the back of the crab and place them in a bowl. Open crab tops up and pour sauce all over and in them, then cover with plastic wrap. Let sit in a cool place and marinate for 30-45 minutes. Place crabs on middle rack of grill (making sure legs stay spread out over grill,) place garnishes on top rack of grill and cook 3-5 minutes basting crabs with the remaining sauce every two minutes. Flip crabs and garnishes(making sure legs stay spread out over grill,) sprinkle sea salt over them, crack fresh pepper over them and continue to cook them for 3-5 minutes (or until shell is crisp and inside is fully white), now basting every minute. If bacon is not yet crisp let grill for another minute or two. 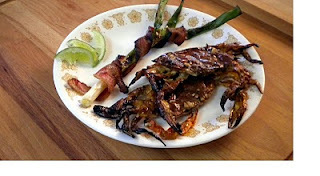 Remove crabs and bacon wrapped green onions from grill. Baste crabs once more and serve over hot or next to garnish. Enjoy!